So in addition to watching my blood pressure and cholesterol level, I will also be watching and taking good care of my kidney to keep my heart healthy. A healthy heart will definitely make my life more enjoyable. I copy the entire article “Kidney health better indicator of heart disease risk” here as a reference. The article is on this web page http://www.khaleejtimes.com/nation/inside.asp?section=health&xfile=/data/health/2015/May/health_May46.xml. The data may help physicians make better decisions on whether patients need lifestyle modifications such as better diets and more exercise or treatments such as statins, medication widely used for preventing cardiovascular diseases, the study said. New York: Simple parameters of the kidney’s functions and damage may be better at predicting the risk of heart failure and death from heart attack and stroke than traditional tests of cholesterol levels and blood pressure, new research suggests. “Cholesterol levels and blood pressure tests are good indicators of cardiovascular risk, but they are not perfect. This study tells us we could do even better with information that often times we are already collecting,” said study lead author Kunihiro Matsushita, assistant scientist at the Johns Hopkins Bloomberg School of Public Health. “If healthcare providers have data on kidney damage and kidney function—which they often do—they should be using those data to better understand a patient’s risk of cardiovascular disease,” Matsushita said. The most common assessment of kidney function checks the blood for creatinine, a waste product of the muscles, and reflects how well the kidneys are filtering it out (called an estimated glomerular filtration rate, or GFR). Another key test measures albuminuria, or how much of the protein albumin leaks out of the kidney and into the urine. The researchers analysed data from 24 studies that included more than 637,000 participants with no history of cardiovascular disease and the results of tests of GFR and albuminuria. They found that both GFR levels and albuminuria independently improved prediction of cardiovascular disease in general, particularly heart failure and death from heart attack and stroke, but albuminuria was the stronger predictor. It outperformed cholesterol levels and systolic blood pressure – and whether someone is a smoker – as a risk factor for heart failure and death from heart attack or stroke. I am considering purchasing a personal (combining personal & work needs) task management application for my Apple MacBook Pro computer. I am preparing to spend $39.99 for OmniFocus for Mac, standard version (vs. $79.99 for Pro version). OmniFocus 2 for Mac manual is my learning documentation; it is accessible from this web page https://support.omnigroup.com/documentation/en/omnifocus-2-for-mac-user-manual/. I copy the introductory paragraphs from that manual in the following. OmniFocus for iPhone, also available on the App Store, is iPhone-only (with basic notifications support on Apple Watch). If you have OmniFocus for iOS, OmniFocus for iPhone provides no additional functionality. OmniFocus for Mac requires OS X Yosemite, while OmniFocus for iOS and OmniFocus for iPhone require iOS 8. I begin to monitor my cholesterol level to minimize future artery-clogging issues and to keep my heart healthy, though I walk, play tennis, swim and hike regularly. I find the following quoted article “11 Tips to Cut Your Cholesterol Fast” by David Freeman an informative guideline for me in keeping a healthy cholesterol level. I quote some points from the article. The entire article is on this web page http://www.webmd.com/cholesterol-management/features/11-tips-to-cut-your-cholesterol-fast. p.s. The following foods might reduce bad cholesterol (low density lipoprotein and triglycerides) according to this article “Foods to Help Lower LDL (‘Bad’) Cholesterol on http://www.webmd.com/cholesterol-management/ss/slideshow-cholesterol-lowering-foods?ecd=wnl_chl_060215&ctr=wnl-chl-060215_nsl-promo_1&mb=WYQVza0sEXokrko1%40IKOxShonS%2fH3cwyXPseqP5xtN0%: dark chocolate, avocados, red wine, green and black tea, nuts (almonds, walnuts, pistachios), brown rice, fishes (salmon, albacore tuna, sardines, and halibut), braising vegetables like carrots or leeks, olive oil, tofu, beans, fruits (pears, apples, oranges, lemons, berries), eggplants. If your fasting total cholesterol level exceeds the desirable level of 200, or if your low-density lipoprotein (LDL, or “bad”) cholesterol is not at your goal, getting it down to a safer level could be easier than you think. In fact, with simple lifestyle modifications — and, if necessary, medicine — people often see significant reductions in cholesterol within six weeks. That depends on several factors, including your personal and family history of heart disease, as well as whether you have cardiovascular risk factors, such as obesity, high blood pressure, diabetes, and smoking. If your risk is deemed high, “most doctors will treat for a target LDL of less than 70,” says James Beckerman, MD, a cardiologist in private practice in Portland, Oregon. If your risk is moderate, a target LDL of under 130 is generally OK, Beckerman says. If your risk is low, less than 160 is a reasonable target. “The trend now is to treat people earlier, especially if they have two or more risk factors,” he says. Several types of cholesterol-lowering medication are available, including niacin, bile acid resins, and fibrates. But statins are the treatment of choice for most individuals. “Statins can lower LDL cholesterol by 20% to 50%”. In addition to lowering LDL “bad” cholesterol, regular physical activity can raise HDL “good” cholesterol by up to 10%. The benefits come even with moderate exercise, such as brisk walking. Robert Harrington, MD, professor of medicine at Duke University School of Medicine in Durham, N.C., urges his patients to go for a 45-minute walk after supper. Doctors used to think that the key to lowering high cholesterol was to cut back on eggs and other cholesterol-rich foods. But now it’s clear that dietary cholesterol isn’t the main culprit. “One of the first things to do when you’re trying to lower your cholesterol level is to take saturated fat down a few notches,” says Elaine Magee, MPH, RD. “The second thing to do is to start eating more ‘smart’ fats,” Magee says. She recommends substituting canola oil or olive oil for vegetable oil, butter, stick margarine, lard, or shortening while cutting back on meat and eating more fish. Fruits and vegetables, including whole grains, are good sources not only of heart-healthy antioxidants but also cholesterol-lowering dietary fiber. Soluble fiber, in particular, can help lower cholesterol. Beckerman says it “acts like a sponge to absorb cholesterol” in the digestive tract. Good sources of soluble fiber include dried beans, oats, and barley, as well as fiber products containing psyllium. Fish and fish oil are chockablock with cholesterol-lowering omega-3 fatty acids. “Fish oil supplements can have a profound effect on cholesterol and triglycerides,” Beckerman says. “There’s a lot of scientific evidence to support their use.” Fish oil is considered to be quite safe, but check with your doctor first if you are taking an anti-clotting medication. Magee recommends eating fish two or three times a week. “Salmon is great, as it has lots of omega-3s,” she says. But even canned tuna has omega-3s, and it’s more consumer-friendly. … Plant sources of omega-3s include soybeans, canola, flaxseeds, walnuts, and their oils, but they don’t provide the same omega-3s as fish. The biggest heart benefits have been linked to omega-3s found in fish. Moderate consumption of alcohol can raise levels of HDL “good” cholesterol by as much as 10%. Doctors say up to one drink a day makes sense for women, up to two a day for men. But given the risks of excessive drinking, the American Heart Association cautions against increasing your alcohol intake or starting to drink if you don’t already. Magee suggests green tea as a healthier alternative to sodas and sugary beverages. Indeed, research in both animals and humans has shown that green tea contains compounds that can help lower LDL cholesterol. In a small study conducted in Brazil, people who took capsules containing a green tea extract were able to reduce their total cholesterol. Extensive research has demonstrated that regular consumption of nuts can bring modest reductions in cholesterol. Walnuts and almonds seem particularly beneficial. But nuts are high in calories, so limit yourself to a handful a day, experts say. Recent years have seen the introduction of margarine-like spreads and other foods fortified with cholesterol-lowering plant compounds known as stanols. Smoking lowers levels of HDL “good” cholesterol and is a major risk factor for heart disease. 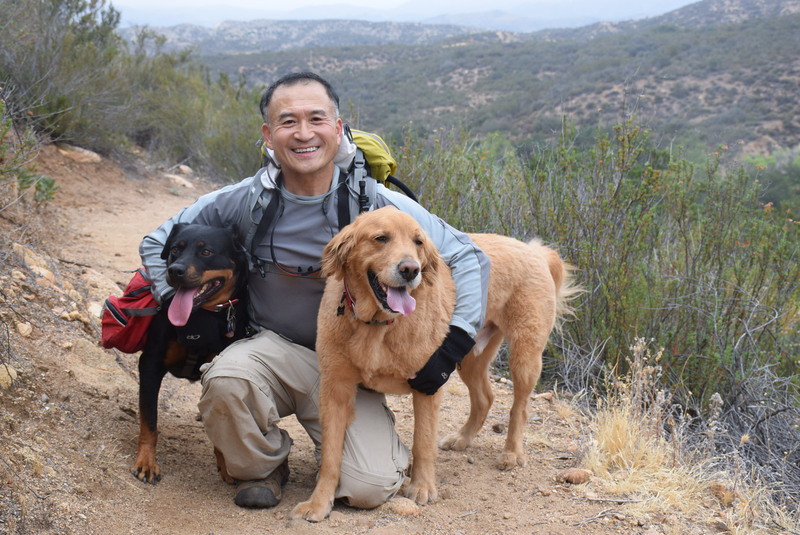 I invited my neighbor George and his 4-year old male Golden Retriever named Chief to join me and my female Rottweiler, Seven, for the Memorial Day (May 25, 2015) hike on Dripping Springs Trail, Temecula, California. Seven likes Chief’s company a lot; they hiked together previously in April 2015 on El Cajon Mountain trail in Lakeside (San Diego area). We had an around 13 miles, 2,600’ elevation gain, hike – a great workout for us and the dogs. I find that this trail suits me well when I want a relaxing and good distance workout hike in a quiet solitude atmosphere, due to its very few (10 or less) hikers on the trail most of the time. The trail surface is often smooth with 13.6 miles (full out and back), 2,800′ (1,600′ – 4,400′) elevation gain. I copy the basic trail information from the National Forest Service’s web site in the following as a reference. The source is on this web page http://www.fs.usda.gov/recarea/cleveland/recarea/?recid=47536. In the Agua Tibia Wilderness. Best times of the year to visit are Fall, Winter and Spring – not recommended for summer, carry water. The trail immediately begins to climb out of the campground on a well-graded incline. The next mile contains some climbing leading to a set of switchbacks. A long strenuous climb ensues until the 3200′ elevation is reached. The trail then makes an easy southward traverse of a basin before resuming a climb to the southwest. A ridge ascent leads to another traverse and the crossing of the only potential water along the trail (seasonal). After crossing the drainage, a short set of stacked switchbacks is climbed leading to a climbing traverse to the trail terminus on the northwest ridge of Agua Tibia Mountain. This is the junction with the Palomar-Magee Trail and occurs in a nice oak grove – suitable for camping. Permit Info: A visitor pass is required for overnight stays in the backcountry. Directions: From the LA Basin take I-15 south to Highway 79 near Temecula. Take Hwy 79 south 11 miles to Dripping Springs. Turn right and park in Trailhead parking lot. From San Diego take I-15 north to Highway 79. Follow previous instructions. The trail is reached by walking south from the parking lot .5 mile through Dripping Springs Campground. To pet a dog or not to pat, that is the question. So I learn the difference between petting and patting a dog; and I actually pet the dog more often than pat the dog. I quote the explanations from two sources. To pet usually involves a stroking motion, whereas to pat involves tapping on just one spot. “To pat” and “To pet” are two different verbs, just as “a pat” and “a pet” are two different nouns..
“To pet” is used for a range of physical activities, including patting, stroking – and several other activities when it is petting a human, not a pet! “To pat” refers to hitting (not violently, though) an object/thing. A kitten pats a table-tennis ball across the floor, you pat your pet on the ribs. I have been feeding my now 3-year-9-month old female Rottweiler dog raw diet (fish, pork, liver, chicken drumsticks, beef) for almost 2 years now since June 2013; she has been healthy with normal weight of 80 lb. Dogs, being opportunistic carnivores, designed to eat things we humans shudder at the thought of, have gastrointestinal tracts which are designed with many unique features that prevent pathogenic bacteria such as salmonella and e.coli from taking over their body and upsetting the healthy balance of intestinal flora. A dog’s saliva has digestive enzymes that contain properties which neutralize bacteria and help prevent harmful pathogenic micro-organisms from migrating in significant numbers into the gut. Any remaining bacteria is then eliminated by strong hydrochloric acids designed, and specific to carnivores, to create just the right pH (1 to 2) for the inherent enzymes to kill any residual bacteria making their way into the gut. When the pet’s immune system is healthy, the few bacteria that might survive the high acid content of the stomach will then pass into the small intestine which in a healthy animal contains the naturally occurring digestive enzymes, bicarbonate and bile salts which are deposited by the liver and pancreas. These enzymes are designed to digest the cell walls of any harmful bacteria that may persist and the bile salts from the liver will digest fats (in their natural, raw state) and transport antimicrobial agents. The healthy digestive tract also secretes a potent enzyme called lysozyme which attacks bacterial cell walls. Any bacterium that may survive this arsenal will still need to adhere to the lining of the intestinal wall for illness to occur. When our dogs are fed foods which have been cooked and/or processed (as is the case with commercial pet foods), they are void of the live enzymes that are critical to proper digestion and health. The dog’s body must then call on the enzyme reserves within itself to process this unnatural food thereby rapidly depleting these critical enzymes. Despite the dog’s natural defenses against salmonella, only a small number of bacteria is required to create infection although, as previously stated, this number is directly related to the immune health of the dog. I thought this video, “Taylor Swift – Bad Blood ft. Kendrick Lamar” is kind of entertaining.